This last one was only about 3mm across, so presented some focusing challenges. 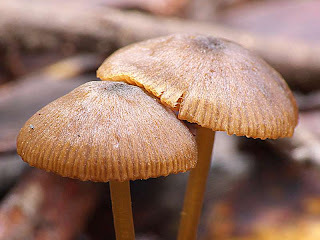 Anyway, I obviously got it a bit wrong, because the front face of the mushroom isn't in focus. 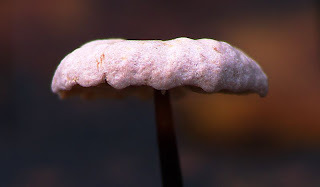 However, more interestingly, there was this tiny white spot scuttling back and forth on the head of the mushroom. It was too small to see what it was with the naked eye, however the photo reveals that it was a tiny bug - seemingly a spider, given the web that is visible. 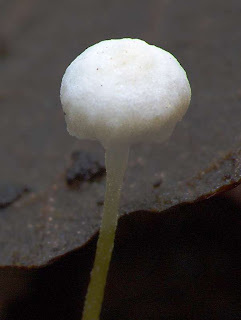 This little fellow is extremely small, only a fraction of a millimetre long. Amazing. 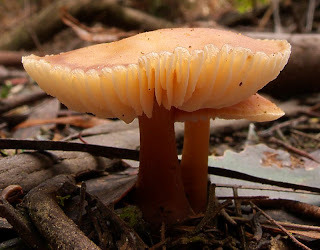 Great fungi. 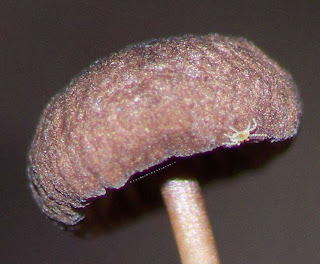 That tiny spider/spiderling is a pretty neat discovery. Love your landscapes too in previous posts. I've been away for a week and have a lot of blog posts to catch up on.